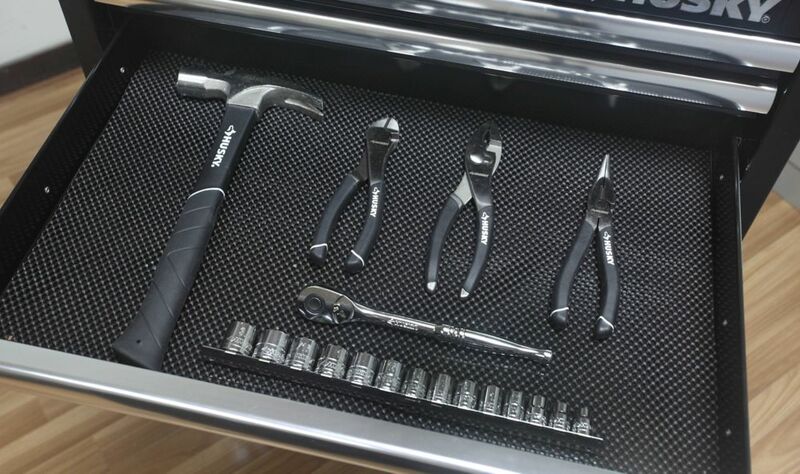 Add drawer liners to your tool box to organize and protect your tools. This roll can be cut to size to fit any drawers up to 15-inches deep. Liners have a non-slip surface that keeps contents in place. Liners are also non-absorbent and resist grease and oil. Roll is long enough to supply up six 27-inch wide drawers. The Husky 18-inch Large Mouth Bag with Tool Wall has 31 internal pockets and 12 external pockets for a range of storage uses. Constructed of 1680 denier SpunTuff fabric for durability, the bag has a dual-zipper top with pull strings for easy opening and closing. 28 internal elastic straps accommodate a wide variety of tools and tool sizes. The Husky 22-inch Pro Grade Rolling Tote features a heavy-duty telescoping handle and three rugged, steel-reinforced wheels for greater mobility. A fold-over rain flap and waterproof zipper help to keep water out of the main compartment, while the tote's weather-resistant material offers additional all-around protection. With heavy-duty carrying handles, 38 storage pockets and four heavy-duty tape measure/pouch clips, this unit is built to handle all your storage needs on the job. The Husky 31 inch 1-Drawer Utility Tool Cart that can be essential in the shop, garage or even the office. The drawer is equipped with 100 lb. rated ball bearing slides to hold a variety of tools. The bottom storage tray is reinforced steel for your larger, heavier items. This utility cart has a 300 lb. load capacity. The top storage area is a perfect place to keep your commonly used items easily within reach. This cart also has an extendable side table and bottle tray for storage and work space. In addition, the drawer and lid has a keyed lock to secure your tools. Equipped with push-bar handle and 4, 3 inch x 2 inch swivel casters with brakes making it easy to be moved around your work space. With no clumsy washers and nuts to deal with, this tool cart can be assembled in minutes with the included bolts and pre-mounted threads. The Husky 33 inch 4-Drawer Mechanics Tool Cart is a heavy-duty utility cart that is essential in the shop, garage or even the office. The multi-sized drawers are equipped with 75 lbs. rated ball bearing slides to hold a variety of tools. The bottom storage tray is reinforced steel for your larger, heavier items and has approximately 14.5 inch of storage space height. The top storage area is a perfect place to keep your commonly used items easily within reach. In addition, the top storage area of the tool cart includes a locking lever to secure the 4-drawers and a keyed lock to secure the lid. The larger, push-bar handle and heavy-duty, 5 inch x 2 inch casters allow this cart to be easily moved around your work area. With no clumsy washers and nuts to deal with, this tool cart can be assembled in minutes with the included bolts and pre-mounted threads. 15.2-inch x 140-inch Premium Solid Drawer Liner in Black Add drawer liners to your tool box to organize and protect your tools. This roll can be cut to size to fit any drawers up to 15-inches deep. Liners have a non-slip surface that keeps contents in place. Liners are also non-absorbent and resist grease and oil. Roll is long enough to supply up six 27-inch wide drawers. 15.2-inch x 140-inch Premium Solid Drawer Liner in Black is rated 5.0 out of 5 by 1. Rated 5 out of 5 by arvinyoga from Good product I recommend people picking up this liner over the smoother liner. Prevents your tools from sliding around. A bit pricey, but recommended.